Niki: Thanks for doing an interview with us! to begin, how did you get interested in history? especially the Tudor era? Aidan: Thank-you for having me! I have been asked where my interest in history comes from many times, and the honest answer is that it has always just been there. Except for a six-month period in my late teens during which time I wanted to be an accountant (dark days indeed), I have always been interested in the past, and finding out how people in the past lived. I do sometimes, however, attribute my interest in history to an episode of Thomas the Tank Engine I watched as a kid, in which an abandoned castle is discovered on the Island of Sodor. I instinctively knew that the castle was both old and important, so I badgered my parents to get me books from the library all about castles – and it has only snowballed since then! Elizabeth has always fascinated me. The idea that a woman could successfully rule a country at a time when women had virtually no political or economic rights made me want to know all I could about her. History at school – and even university – is often skewed towards famous men; so reading about Elizabeth (as well as her half-sister Mary I, and her cousin Mary Queen of Scots) allowed me to address this imbalance. I should also confess that Queenie from Blackadder added to the fascination. Niki: Your latest article contribution to the RSJ is fascinating. Is this a subject you’ve been studying for years? Aidan: That’s very kind of you. I first started thinking about Elizabeth’s biblical analogies during my undergraduate studies, when I first came across the account of Elizabeth’s Coronation Procession – The Queen’s Majesty’s Passage. In the fifth pageant, Elizabeth is exhorted to behave like Deborah the Judge, and Elizabeth herself is recorded to have prayed before the procession began in thanksgiving that she was preserved during Mary’s reign, as Daniel was from the lion’s den. What struck me about the references to these biblical figures is that almost everyone who heard them would have known about them, and understood the connection that was being made. Attendance at Church was all that was necessary to know the story of these major biblical figures, rather than the formal education one would require to understand what was meant by an allusion to Astraea or Diana. The fact that Elizabeth herself also used the analogy meant that they were clearly useful. From there, it was simply a matter of reading as much of the scholarship I could that analysed the phenomenon. Aidan: Almost two years’ worth, to be honest! Not only did I have to find the analogies in the primary sources – thank-you EEBO! – I also had to research what the context for the analogy was, and what the analogy was being used for. This was more challenging than previous work because the late seventeenth century is beyond my usual area of research, so it took some time to get up to scratch with the history of the period and with the historiography. Aidan: There were two main things about my research that surprised me. The first was the longevity of Elizabeth’s analogies. I really did not expect them to continue appearing for a century after she died, especially after the Civil War and the Commonwealth. It highlighted to me the importance of not letting your assumptions get in the way of your research, and also how potent the combined use of religion and politics was in the Early Modern period. The second thing that surprised me was how so few of the primary sources I was locating had previously been analysed in the scholarship. While the concept of the analogies, and the theory behind them, has been well studied, there appeared to be a limited focus on the actual sources themselves. Hopefully, with the advent of EEBO, and the increasing access to these original sources, the analogies themselves will come to the forefront of analysis. Niki: What are you working on next? Aidan: I am currently researching some of Elizabeth’s analogies that are less analysed in the current scholarship – particularly those to Daniel the Prophet and the widow Judith. My major project, however, is an analysis of the analogies that were used by both Mary and Elizabeth, with particular emphasis on how the different religious beliefs of the two queens influenced the way in which the analogies were employed, and the way in which gender was factored into the analogy. Niki: Hi Sara! Thanks so much for doing this interview. To begin with, how did you get interested in your specialization? Is this something that struck your interest at a young age? Sara: During my undergraduate studies, I was always interested in gender history, but my primary interest was the court of Charles I, particularly the politics of the 1630s. When I was researching my undergraduate dissertation on the king’s personal rule in Durham, I was surprised at how little Caroline court women appeared in the general histories of the period. This was something that I hoped to address at postgraduate level. Niki: Is there something particularly interesting about Queen Henrietta Maria and her court that led your research to be focused on that particular time in British history? Sara: I found S.R. Gardiner’s assertion that Henrietta Maria was a ‘gay butterfly’ at odds with work that I was reading during my doctorate by Caroline Hibbard, Malcolm Smuts, Erica Veevers, and Karen Britland, which showed that the queen was a woman of political, cultural, and religious acumen. I was particularly interested in the practicalities of a mixed marriage in seventeenth century England. For instance, how Henrietta Maria’s Catholicism shaped the ceremonial culture of the Caroline court, but also helped to further the exchange of confessional ideas by the 1630s. Of course, it goes without saying that Charles I’s reign is a period of intense historical interest with his early wars with Spain and France; the king’s personal rule; his relations with parliament; the civil wars; and the aftermath of his execution. I wanted to understand how early modern women at the apex of society negotiated the position of themselves and their families during this time, above all during the post-1642 period. Niki: If you can, how would you best describe Queen Henrietta Maria’s character? Sara: Steadfast, loyal and vivacious. Niki: Do you think aristocratic women and their role in politics has been largely ignored by historians? Sara: Since Barbara J. Harris and Sharon Kettering emphasised the ways in which women could engage informally in politics through patronage networks and personal relationships, the political activities of elite women have been addressed by a number of historians and literary scholars. The recent edited collection by Nadine Akkerman and Birgit Houben, where I published a chapter on Henrietta Maria’s Bedchamber, made a point of looking at ladies-in-waiting, rather than queens, queens consort and royal mistresses. It was encouraging to be asked to be a part of that collection. Niki: How did you get CCCU interested in awarding prizes for RSN? and how does the nomination process work to be eligible for the prize? Sara: Canterbury Christ Church University has a number of historians and literary scholars interested in royal studies, such as Prof. Louise Wilkinson, Prof. Jackie Eales, Dr Astrid Stilma, and Dr Leonie Hicks. The opportunity to collaborate with other institutions to further our research culture is part of our research objectives and sponsoring the Royal Studies Journal seemed like the perfect opportunity. The prize will be awarded on an annual basis to the best postgraduate article published by the Royal Studies Journal. Niki: Lastly, what are you working on now? We look forward to reading your work. Sara: I am currently reworking my PhD for publication with Manchester University Press. I’m also working on transnational relations between the Dutch Republic and the Stuart crown in 1641-3. I’m publishing an article on Henrietta Maria at the court of Frederick Henry in a Special Issue for Women’s History Review, which will be forthcoming next year. Exhibition: “The Portrait in the Royal Collections: from Juan de Flandes to Antonio López”. Royal Palace, Madrid. December 4th, 2014-April 19th, 2015. 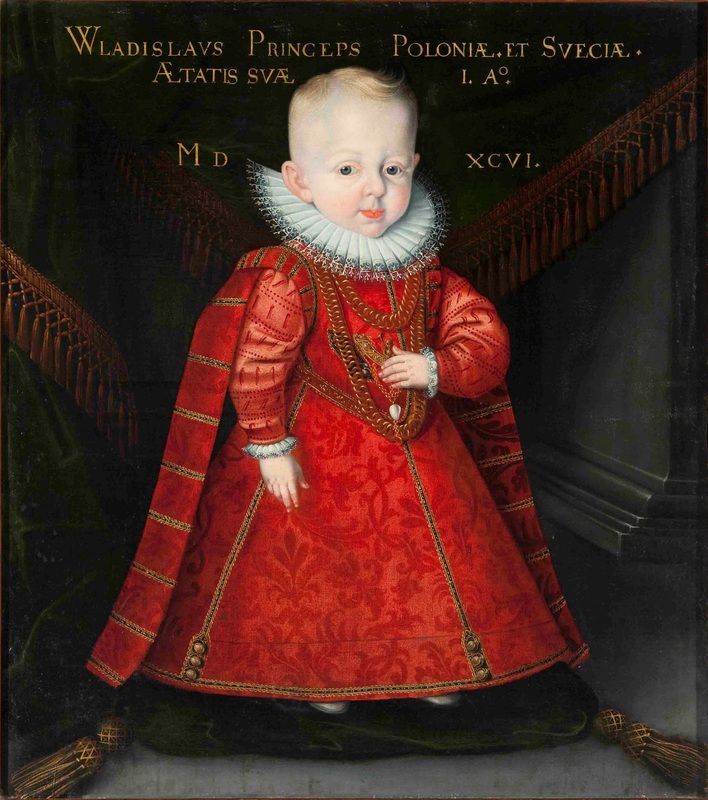 In the Early Modern period, as many studies had recently shown us, the royal portraits were sometimes used as a substitute of the royal person itself, as a true embodiment of the royal power. This is a special meaning of the royal visual imagery that had been a little lost in an age dominated by image technology, but we can sense once again in the rooms of temporary exhibition of the Royal Palace of Madrid, where you can see more than a hundred of portraits of different royal people that dominated Europe for more than half a millennium. In this great exhibition, people can see some of the most important pieces of the Spanish Royal Collections, dating from the XVth century to the present, because the last painting shown here, an image of the late king of Spain Juan Carlos I’s family, has been presented to the public for the first time ever in this exhibition. With portraits that range from the painting that Roger van der Weyden made of Philip the Good, duke of Burgundy to the contemporary representation of the king Juan Carlos I made by Dalí, through the works of authors as important as Jakob Seisenegger, Antonio Moro, Juan Pantoja de la Cruz. Peter Paul Rubens, Hyacinthe Rigaud, Jean Ranc o Joaquín Sorolla, among many others, this exhibition show together paintings and sculptures that allow us to see the evolution of the royal representation and the conception of the relationship between image and royal power from the first decades of the Early Modern Age to the present. However, we must take into account that this exhibition isn’t exclusively focused on royal portraits. In fact, it tries to bring to light the most important examples of portraiture kept in the Spanish Royal Collections, so this exhibition shows some portraits that don’t represent royal people per se. But if we take into account that, of the 113 pieces shown in this exhibition, only seven of them represent people that aren’t usually considered as royals (even if they are members of the court closely linked to the royal family’s circle), we can consider this as an exhibition centered around the image of the royal family and the royal power through the centuries. Even if it’s impossible for the people who know well the History of Art linked to the Spanish Monarchy to not miss the famous royal portraits that are shown at the Prado Museum and that aren’t in this exhibition, like the magnificent portraits made by Tiziano, the renowned royal representations made by Velázquez or the great Bourbon family paintings made by Van Loo or Goya, this exhibition has the added charm of showing portraits of a extraordinary quality and significance that are usually kept in less known monuments and, as a result, are sometimes almost unfamiliar for the great public. In fact, some of these paintings aren’t shown to the public in the places they are usually kept or are in places where they are difficult to see by the visitors; that’s why the possibility of enjoying some of the pieces shown in this exhibition can be considered as a real privilege. This is the case, for example, of the marvelous portraits of the little prince and princess Vasa of Poland (we will return to these portraits again later), kept in the magnificent convent of the Descalzas Reales of Madrid and are usually shown in a dark corridor where they are difficult to see and appreciate, so this exhibitions is probably the first time we can see these enchanting portraits in all their glory in years. Likewise, the interesting but mostly unknown engraving titled “The king’s lifting over the pavés in front of the Courts of Navarre”, made by Dionisio de Ollo, is usually out of the public view in its home in the Royal Library of the Royal Palace itself. This way, works that are kept in spaces as unfairly unknown by the general public as the mentioned convent of the Descalzas Reales, the Encarnación, the Santa María of Las Huelgas of Burgos or the Royal Palace of El Pardo, for example, have the opportunity to be seen and enjoyed by a greater number of people of all nations. This exhibition presents to the great public paintings and sculptures of great quality and significance that will thrill even the most expert of royal historians. That said, I think there are two main strengths in this exhibition that deserve to be taken into account. 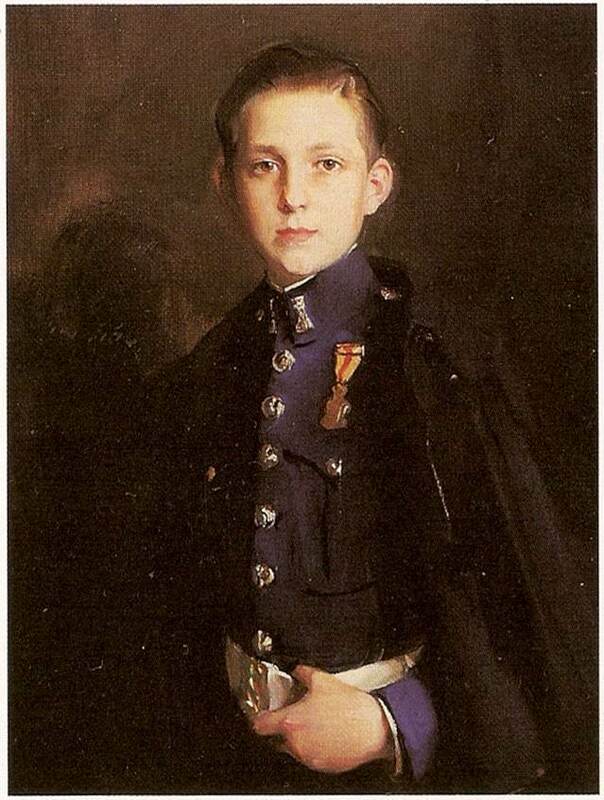 The first one is related to the numerous and delightful portraits of royal children that are shown in this exhibition. Unique in their genre, the young princes and princesses that are shown in this exhibition are represented with all the dignity and formality of their rank, but they still can transmit the kind of innocence and gentleness typical of their young age. Amongst all the children portraits shown here, there are several that stand out. The first ones are a pair of portraits with the image of the princes of Poland Anna Maria Vasa and Vladislaw IV, paintings that I have mentioned before in this review. This two young children, painted when they were three and one year old respectively, are dressed just as if they were adults, with rigid court clothes and heavy jewels, where only the velvet cushion in which the young prince stands (proof that he was so little that he can’t even stand securely on his own) and the tenderness of their young faces are the only things that betray the innocence of their ages. 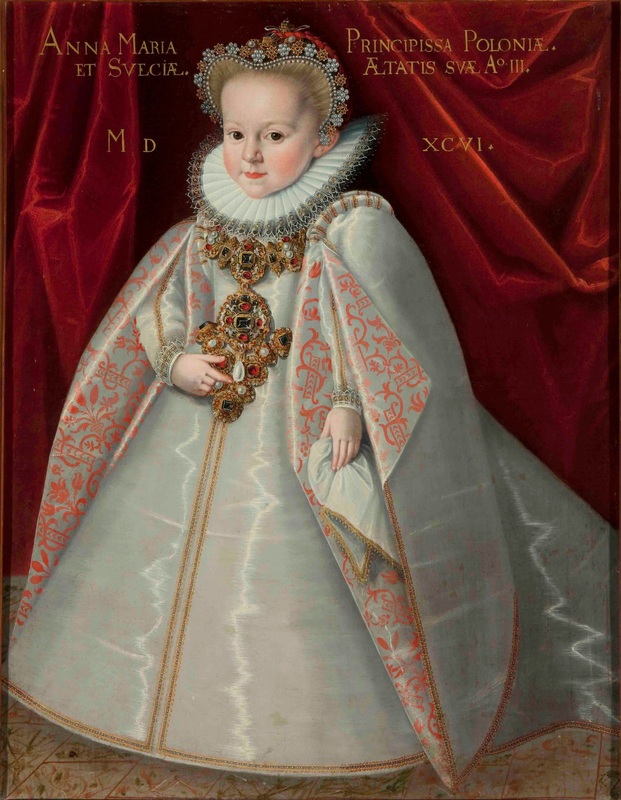 Next to them is another very singular portrait, in this case of young princess Anne of Austria, later queen of France, who was just several months old when it was painted. She appears sitting in a red cushion, as she couldn’t even stand yet, but this detail doesn’t take away even a bit of solemnity to the formal stance and regal expression of the young princess. In this case, what attracts the viewer’s attention the most is the great variety of protective charms and relics that cover her little body, a visual proof of part of the belief system of the Baroque, in which they were trying to protect royal babies from illnesses and premature death that they couldn’t explain and against they couldn’t fight with a mix of superstition and traditional religiosity that can be perfectly appreciated in this truly interesting portrait. Lastly, taking a leap of a hundred years, we change centuries and dynasties to see how some of the symbols traditionally used by the Habsburgs share space with elements linked to the new dynasty. In this last case are especially important those children portraits that represent several of Charles III’s sons as classic gods. 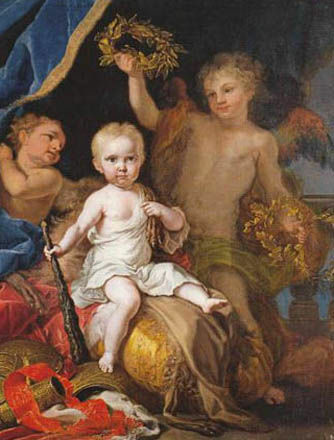 Two of those children portraits are shown here, the portrait of prince Ferdinand of Bourbon as god Mars and the one of Charles Antonio of Bourbon as Hercules. These young children, painted as divine gods, reflect the continuity of important previous models though its simbology and presentation, still a little hieratic and way too formal for children portraits if we compare them with other portraits of little princes and princesses of that century, but we can perceive several characteristics of the change in perception that will transform these kind of representations, of a more familiar nature, without leaving behind the royal significance that must accompany the portraits of the members of a royal family. 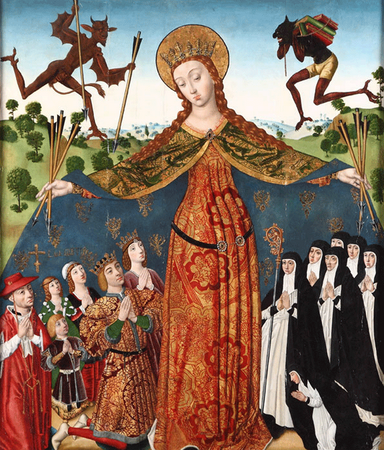 These are only some of the many marvelous children portraits shown in this exhibition, from the little effigies of the Reyes Católicos’ children that appear under the protective cloak of the Virgin of Mercy (1486) to the portrait of the grandfather of the reigning king of Spain don Juan of Bourbon as a teenager (1927). The second of the main strengths that, in my opinion, have this exhibition is the possibility of perceive how the different royal portraits adapt to the political and representative necessities of every moment to transmit effectively the meaning that every monarch need to present in a determined instance, something that can be appreciated better when we can observe different works at the same time. This exhibition is a wonderful opportunity to unravel the political and ideological significance that these portraits transmitted to their contemporaries and to see the intent behind their creation. 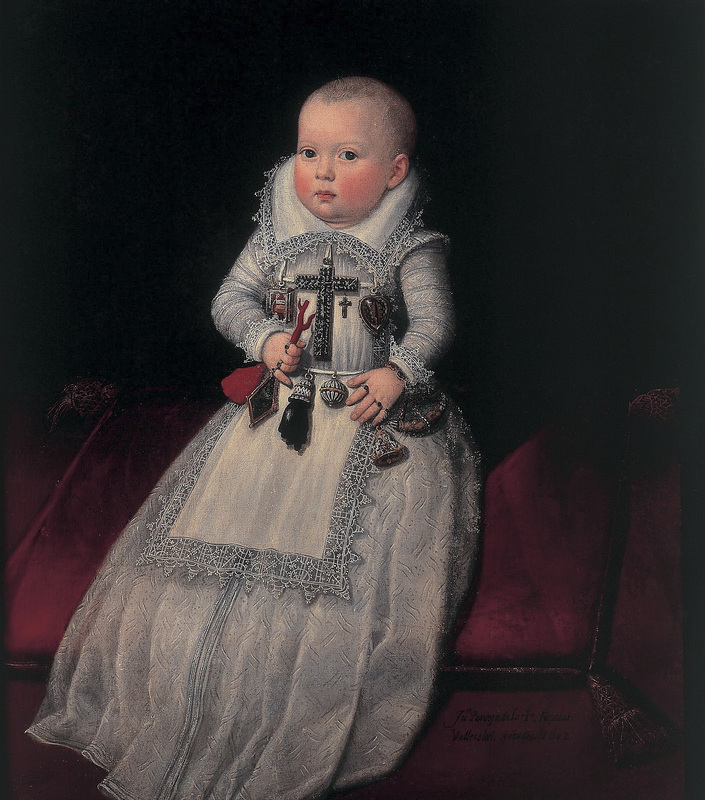 It was very different the purpose behind the conception of portraits like the ones made of the little Bourbon princes to let their grandfather know them and those paintings like “The Virgin of Mercy”, kept in the monastery of Santa María of Las Huelgas of Burgos, for example. 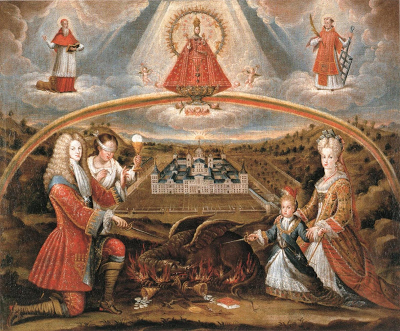 In this painting, the presence of the Reyes Católicos and their children legitimize the position of the abbess Leonor of Mendoza, sister of the powerful, cardinal Mendoza (who, by the way, is also present in this painting), that was designated for that position against the wishes of the rest of the nuns after the deposition of the previous abbess. 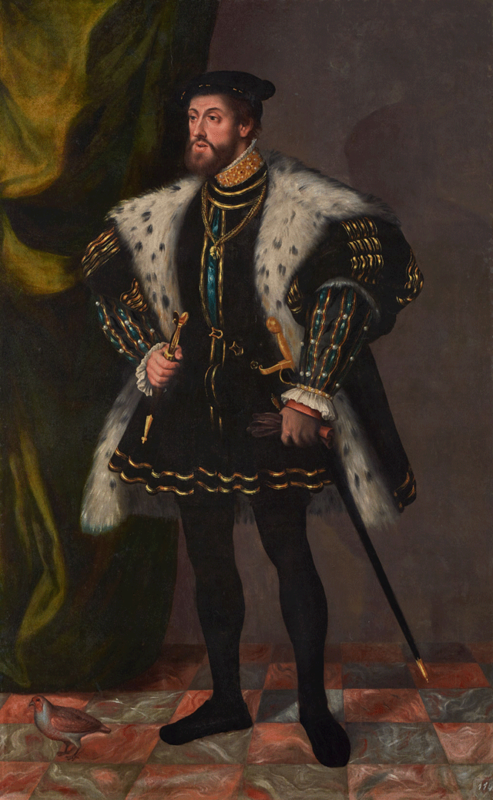 We can also appreciate a strong underlying meaning in the portrait that Jakob Seisenegger made of the emperor Charles V, who was represented with court clothes because he wanted to present a conciliatory image of himself in front of his protestant subjects, as he still hoped to reach a lasting agreement with them. Lastly, I can also mention the painting called “Allegory of Philip V and his family fighting against heresy”, linked to the War of Spanish Succession, during which the Bourbon party attacked the supporters of the archduke Charles of Austria accusing him of permitting the entrance of heretics (English, Dutch and some Germans from protestant territories) in the Spanish Monarchy. He is presented here as the protector of Catholic Faith, but it also has another meaning. The order of St. Jerome that lived in the Monastery of Saint Lorenzo El Escorial needed to make peace with the new king and to assure him of its unwavering loyalty, as the monks had had some disputes with Philip V during the war. One of the most interesting of these disputes, for example, was told by Fray Nicolás Jesús Belando. He wrote that once, when queen María Luisa Gabriela of Savoy had to get out of Madrid fairly quickly because the troops of the archduke Charles were nearing the capital, she arrived to the El Escorial and there, according to Fray Nicolás, “she found closed the gates of her own home” when the monks denied her entrance to the monastery and had to sleep in the street with her young son. These are only some examples that allow us to analyze and understand the different dimensions of the royal portraits and how they can transmit different messages depending on the political circumstances of the moment they were created. Lastly, I must add that this exhibition has the ability of surprising us in every step. Without doubt, several of the portraits shown here still have secrets awaiting to be discovered, like the case of the strange portrait of king Charles IV backwards, made by Juan Bauzil, almost unique in its nature, whose meaning haven’t been unraveled yet. In any case, those historians interested in the History of Monarchy have a date in Madrid this spring. If you can, don’t miss this exhibition. You won’t regret it. Niki: Hi Nadia, thanks for doing this interview! First, your article presents us with results from an experiment in the classroom with a Tudor play. Could you tell us a bit more about this? Nadia: The Teens and Tudors project came forth from my PhD on spectator risk management in early English drama, which I have completed at the University of Southampton in 2014. I was very keen to make part of a chapter of my thesis accessible to a wider audience through outreach, and decided on Heywood’s Play of the Weather as the project’s main focus, especially due to the fascinating socio-political context in which it was originally performed: the court of Henry VIII. Of course I’m not the first one to offer a staged reading of Heywood’s play; the Teens and Tudors project has been influenced by Staging the Henrician Court, an interdisciplinary project led by Professor Thomas Betteridge and Professor Greg Walker between 2008 and 2010. I was really excited about their project and website, which contains some very excellent teaching aids, such as video clips, articles and a discussion forum. With Teens and Tudors I wanted to contribute to existing studies by investigting how we can use staged readings or research performances as an exciting outreach tool for secondary schools, and of course as a teaching method at university level. The age of the actors in my project is relevant in that where staged readings tend to be performed by adult actors, I wanted to see whether the play, which was originally performed by schoolboys in 1533, would be better understood if the reconstruction were performed by teenagers in the same age category. Linking Heywood’s play to the performance context of the Tudor court, meant that I could offer students a close reading tool that relied on getting to know the politics, gossip and lay-out of the Henrician court. I would project a lay-out plan of the Henrician great hall, and would use the actual space of the classroom (rid of tables and chairs) to help students decide where in the space lines from the play would be best uttered, and if the positioning in the room would have had any political implications in 1533. Furthermore, this set-up enabled us to discuss issues around gender, satire, and the dangers of performing drama that actors would have faced. I have worked with 3 fifth form groups at a grammar school in The Hague, of which all students were non-native speakers of English. I was really impresed with how quickly they picked up on Heywood’s language, and especially the puns. I am very grateful for the school’s cooperation, and of course of the support and advice given by ICLON, the University of Leiden Graduate School of Teaching, and the Centre for Medieval and Renaissance Culture at the University of Southampton. Niki: Great! Now, you’re bridging the gap between gymnasium and university with this project – where is your focus? Is it more about bringing new pedagogy to the classroom? or about doing research on classroom dynamics for the university? Nadia: That’s a good question! In fact, I find that addressing the bridge between school and university is very necessary and rewarding. I am a lecturer at the University of Leiden, so I usually teach university students. However, I do find that fifth and sixth form pupils are very capable of engaging with literature that it slightly more ‘out of the box’, in terms of the ‘standard’ curriculum for literature. I also found that certain prescribed authors tend to intimidate teenagers, for example, Shakespeare. The last thing I want to do is ‘freeze’ the students’ creativity of mind by offering them a text that that intimidates them before they have even started reading. The beauty of using Heywood of course, is that he is obscure enough for students not to have heard of his work, so that they enter the workshops more openmindedly. In terms of method, my project has been two-fold. On the one hand I wanted to unite a theory used in language teaching called Total Physical Response Theory (TPR) in which the movement of the body is used to remember information, and Cognitive Theory linked to the late medieval and early modern ways of using drama as a teaching tool. At the same time I was very interested in testing how classroom dynamics could be changed and history and literature could be made more accessible to students who do not find it easy to use older sources, because they find themselves lost in the works, or easily distracted. Niki: That sounds great. Could you recommend anything for teachers – be it at the university or the gymnasium for recreating this experience? Nadia: Last month, I have given a workshop for teachers at secondary school and sixth form level at the national Good Practice Day hosted by the University of Leiden Graduate School for Teaching (ICLON). We discussed how TPR can be used in the classroom, not just for teaching playtexts, but also as an approach to novels and historical sources. For the latter it is good to keep in mind that although we historians are left with the written records of events, most aspects of medieval and early modern life were ‘played out’ in public. I am thinking of judicical matters, such as trials and executions; religious ritual or ceremony; educational, traditional, commercial, political, and festive activity. As such, situations such as these can be easily visualised for the classroom context, both at the university and at sixth form college level. For the latter group it is even more important to be made aware that historical records are not dull and difficult exercises of solitary reading, but rather a record of highly exciting public events that happened in past communities. Students need to be made more aware than ever, that persuing a degree in the Humanities is worth their while, and can open up new worlds. Niki: Thanks so much for your time! and good luck with your research. RSJ Blog: What should a book review for the journal include? what do you hope the reviewers convey to the readers in the reviews? Stephen: Ideally a good review should contain a thorough description of the book, its layout and its central arguments. It’s important to know what new directions the book is taking, what new things are being said, and what its overall strengths and weaknesses are. I hope reviews are able to convey a detailed impression of the work for readers so that they might judge where it stands in the wider body of literature already published. RSJ Blog: How long should the reviews be? Stephen: Generally a length of about 1000 words should be sufficient for a single book review, give or take a couple of hundred either way depending on the tome. RSJ Blog: How old can the reviewed book be? Does the journal primarily review new releases? or are older books also relevant for the field of Royal Studies? Stephen: New releases are always better, it allows us to keep up to date with current publishing and developments in the field. If a book has been released within the last couple of years it should be suitable. Older works that have been updated or reprinted are still viable for review. RSJ Blog: How do you match reviewers and books? Stephen: We try to match books to reviewer’s expertise and areas of research so that those who know the field best can comment with authority. That is often easier said than done since some areas prove more popular than others. By appealing further afield and promoting the journal we can hopefully attract more potential reviewers and so include a greater diversity of books. RSJ Blog: How do you select which book reviews make the journal? Are there thematic clusters, or just whatever is ready at this moment? Stephen: It’s always good to try and get a bit of a thematic and chronological spread so as to appeal to a wider audience. It’s very easy to focus upon medieval and early modern periods for example, but there is an awful lot of other material out there. As its early days we are a little limited but as more issues come out I hope the range of reviews grows. RSJ Blog: How can I search for a book review on the journal homepage? Stephen: There is a general search function for the journal website as well as the ability to view the latest and previous issues. RSJ Blog: How long does the process between submitting a book review and having it published usually take? Stephen: The process can be very short. The journal will be published every six months so as long as the reviewer is prompt in returning their review to the journal it could appear in the next issue. RSJ Blog: Are there any differences from the technical/administrative side between authors and reviewers? Stephen: Not specifically, it’s really just a question of size. Reviewers are still held to similar standards as authors are. RSJ Blog: Is there anything additional about the book reviews you’d like to add? Stephen: Don’t be afraid to be honest in a review, give praise and criticism where it is due. RSJ Blog: can you tell us a little bit about your current research? What is your most recent project? Stephen: My current research focuses upon the Latin Kingdom of Jerusalem in the early thirteenth century and how it recovered politically, socially and economically from its near destruction by Saladin at the Battle of Hattin in 1187. I’ve bee trying to determine what impact such a disaster had upon not only the physical aspects of Frankish civilisation in the Crusader States, but also its effect upon mentalities in the Holy Land, Islam and Europe at large. My most recent work has been examining the prosopography of the Kingdom of Jerusalem around 1200, trying to determine changes to political culture and also attempting to identify trends of immigration. RSJ Blog: What led you to pursue this topic? Where did your passion of Medieval history originate from? Stephen: This topic came out of the research I did for my PhD at Swansea University. I was originally doing an examination of the reign of Saladin but that soon changed as I became more engrossed with the consequences of the Battle of Hattin. I suppose I should blame my parents. They had the audacity to live in Warwickshire in the shadow of two fine castles at Warwick and Kenilworth which were everyday landmarks when I was growing up. Whenever we went on holiday or a trip we would always swing by some sort of medieval ruin or another. RSJ Blog: Thank you, Stephen! RSJ Blog: First, in your opinion, why is the study of royal history important? Michael: It is central to the national history, politics and high society of all countries until very recent times (say 1900) and in many places, eg Saudi Arabia, still is. Royalty actually ran things. RSJ Blog: Absolutely. Do you think royal history is increasingly becoming more popular and well recognized? Michael: Not really. Until relatively recently all History was political and therefore generally involved monarchs. Now of course there is much more thematic range to history and royalty is becoming a theme worthy of academic recognition and definition and all aspects of royalty,eg queens, courts etc are attracting more attention. RSJ Blog: Great, now how do you draw conclusions or fill in the gaps on the actions and characters of some of the medieval English monarchs? Michael: Set them in context, take account of other players, apply standards current at the time. Gaps. Search for more records. Inevitably there are gaps that cannot be filled. Very few straightforward statements of motives or intent. Deduction from actions is the main route. I find that if you keep looking at the same events from different points of view, new perceptions arise. I have a fuller understanding of Richard III now than ten or twenty years ago. RSJ Blog: Thank you; and lastly, what do you hope to explore and/or work on in the near future? Michael: Richard III and His Family forthcoming this winter. New biography of Richard III.